The cause of MS is still not known. Both genetic and environmental factors are important, but how they interact to produce episodes of localised inflammation over many years is not clear. 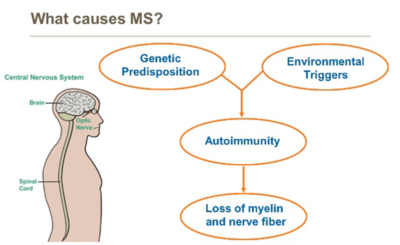 MS is widely regarded as an autoimmune disease. Here the body produces a misdirected immune system attack on its own tissue—in this case the myelin sheath that protects the axons, but that has never been firmly established. A reaction to a virus hidden in the CNS has been long suspected, but also not proven. In persons with MS, the immune system appears to be normal in all other respects. MS is not a hereditary disorder in the sense of being passed directly from parent to child. The increased risk in close family members is not attributable to a single gene, but most likely related to several genes whose function is not well understood—some of these probably influence the body’s immune reactions. A striking environmental feature is the increase in prevalence of MS in higher latitudes both above and below the equator. In NZ, for example, the prevalence in the South Island is approximately twice that in the upper half of the North Island. The pattern of migration from Northern Europe may contribute to that distribution, but undetermined environmental factors are most important. Among many possibilities, exposure early in life to a virus infection that has a long-term effect on immune responses is thought most likely. However, none of the numerous viruses suspected can be directly linked at present.